I have always liked Louis Vuitton bags but have never took the plunge and bought one for myself. I do have one I got as a gift though. 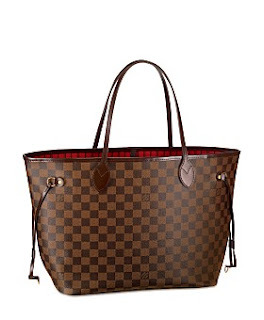 Since my new obsession are diaper bags I thought that maybe I can get away with buying the LV Neverfull MM and using it as a purse and a diaper bag. It will be dually functional. I wouldn't have to buy a purse or diaper bag for a long while. It's a good quality bag so it will hold up. It's stylish and cute and the interior is RED....bonus! What do you guys think??? I say, Go for it!!!! You should def do it. They are worth every penny. I bought the gray-white checkered Large Neverfull and I carry it everyday. It holds everything your baby needs and is way cuter than a regular diaper bag. and it cleans so easily. I can't say enough good things about them! Sadly my husband knows what they cost so its hard to sneak LV's in this house! I have been wanting this bag for the same reason! your diaper bag is your new purse so GET IT! I plan on making a move towards something nicer my self! Very classic! I have recently fallen in love with Coach purses (not the ones with the c's all over them.......I am too pain-Jane for those). The way I justify buying them is that they will not go out of style AND the quality fantastic. Go for it! oh i always think LV is a great idea! I have a slight obsession myself - luckily my husband 'gets' fashion and every once in a long while I am surprised with something new!!! Love that bag! You should get it! Ya you should get it!!! Every woman deserves a nice bag. Oh you so need this! I have the monogram Neverfull GM (the big one) and I LOVE it. JD bought it for me for "mothers day" when I was pregnant last year and I was SO thrilled. All of my mom friends agree the the Neverfull MM and GM's make for great "baby" bags!! I also ordered a "base" for mine off of ebay. If you get it let me know and I'll look up the seller I used. It's only $20 but makes a huge difference in the shape of the bag! Ok, I have wanted this bag....but can't bring myself to buy it! Maybe I will change my mind.... Would be an awesome bag for any mommy's life!